Campaign for the American Reader: Pg. 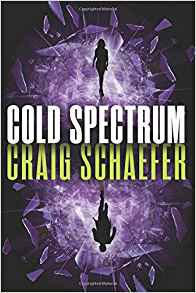 69: Craig Schaefer's "Cold Spectrum"
Featured at the Page 69 Test: Cold Spectrum by Craig Schaefer. Criminologist Harmony Black is a witch with a loaded Glock. Her partner, Jessie Temple, is packing fierce lupine heat. Together, they’re part of Vigilant Lock, an elite FBI black ops group dedicated to defeating criminals with supernatural connections. But when they uncover a demonic conspiracy in the highest ranks of the government, it appears that everything Harmony and her friends have worked for, fought for, and risked their lives for might be a lie. The only way they can clear their names is to take down the conspiracy from within and uncover the truth behind a secret that both the government and the powers of hell want to keep buried.